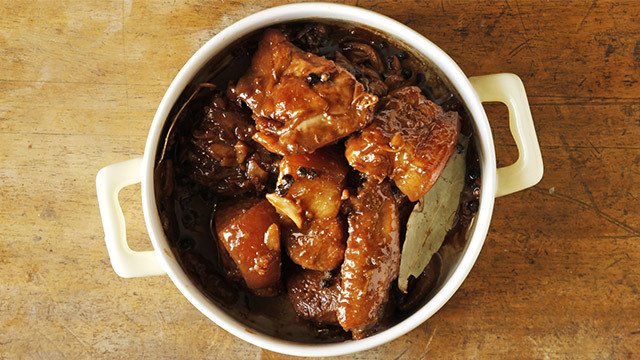 Filipino pork adobo is a staple in many Pinoy homes. This pork adobo flakes recipe is made from leftovers: use your hands or a fork to shred the meat, then fry it until crunchy. It is delicious with lots of rice, fried garlic, and fresh tomatoes. Remove meat from the sauce and shred the meat with your fingers, gently pulling apart the meat fibers. Set aside. Heat oil over medium heat on a frying pan. Add shredded adobo meat and adobo sauce and sauté. Fry meat until brown and crispy. Let drain on paper towels before serving. Serve with rice, fried garlic, tomatoes, spring onions.